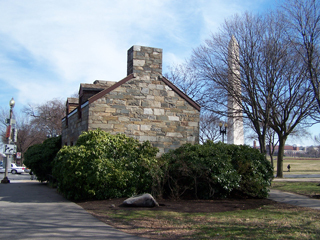 The Lock Keeper's House, at the corner of Constitution Ave. and 17th Street N.W., is one of the oldest of the stone houses in the city. It was built around 1835 to serve as the residence for the lock keeper of the Washington City Canal. The canal passed in front of the house and emptied into Tiber Creek and eventually the Potomac River. The canal was considered unhealthy and a source of disease, and was filled in to create the Mall area. The house is the sole reminder of the old ditch. In 2017, the house--weighing 110 tons--was relocated approximately 30 feet to make space for a larger renovation of Constitution Gardens. The house was restored and reopened to visitors as an educational site about the history of the mall and the city canal.